On October 8, Chief of the General Staff of the Army and Armed Forces, Gen. Ali Abdullah Ayoub officially announced that the Syrian armed forces had started a large-scale assault aimed at retaking several key cities and regions from terrorist forces after a week-long bombing campaign by Russia targeting the jihadists. A day earlier, SouthFront: Analysis & Intelligence reported that Syrian forces start full-scale offensive. The main aims are the Hama-Homs axis and to lift the ISIS siege of the Kuweries Military Airport. Today, the Syrian Arab Army (SAA) with the National Defense Forces (NDF) conducted a large-scale offensive at the terrorist-controlled towns of Kafr Zita, Qala’at Al-Madayq, Latmeen, and Al-Lataminah in the Hama Governorate. The Free Syrian Army, CIA-backed Liwaa Suqour Al-Ghaab, Sham Legions, Jabhat Al-Nusra and Harakat Ahrar Al-Sham militant gropus oppose the Syrian forces there. The clashes started off successfully for the SAA as they recaptured Al-Mughayr, Lahaya, and Markabah. Following this success the SAA advanced closer to the Idlib-Hama border, capturing the hilltops of Tal Sakhar, Tal-Sikeek, Tal Uthman and the town of Al-Haweez near the city of Kafr Zita. A the moment the SAA is reaching the Latmeen-Morek axis and the eastern perimeter of Latmeen. The primary objective of this offensive is to seal off the Northern Hama border with Idlib and build a buffer-zone around the city of Khan Sheikhoun located on the important Aleppo-Lattakia Highway. 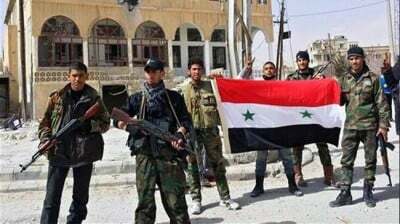 Then the government forces will be able to concentrate on the remaining pockets in the Hama governorate that are under the control of the militants. First is Russian Navy got a combat expirience of usage of the Russian Kalibr missile systems (3M-54 Klub) which are intended to strike naval and land targets. Second is this act required cooperation from Iran and Iraq because missiles had to travel through their airspace to reach Syria. At the same day, the chairman of Iraqi parliament’s defense committee Hakim al-Zamili said that Baghdad may soon officially request Russia for airstrikes against ISIS. In this case, the Russia-Iraq-Iran-Syria joint information center’s role will be expanded to coordinate Russia’s airstrikes in Iraq. Thus, we could conclude Iraq was almost moved from the US zone of influence in the Middle East. Third is it’s a demostration of power for the Russia’s “Western partners”. Earlier, the head of the Defense Committee of Russia’s State Duma, Vladimir Komoyedov, said that Russia is ready to use its naval forces to establish a blockade along the Syrian coastline to facilitate the delivery of armaments for terrorists in Syria. Russia shows that it can defend its military group in Latakia even from the Caspian Sea. The Russian military group in Syria seriously depends on the supplies through maritime. So, if Turkey which failed its policy in Syria decides to cut it from the Russian Naval base in Crimea closing straits, Russia will be ready. On October 6, Erdogan said that Russia could lose a friend as Turkey. But his relationships with the US becomes colder also. At the moment, it’s clear that there are no moderate repebls which could be publicly supported by the US in Syria. Free Syrian Army (FSA) is more a myth then reality. A large part of the FSA’s units are directly linked to the Syrian Al Qaeda. The US in this case surely needs some controlled force in Syria as alternative to Assad in order to prevent him from regaining full control over the country. The only candidate for this role is the Kurdish YPG. The US will likely support the Kurds in an attack on Raqqa, the Islamic State headquarter and important logistic center in Syria. This alliance is unacceptable for Turkey which strongly stands against any kind of Kurdish autonomy at its borders. Furthmore, Rakka is a crucial point for the Islamic State’s oil trade with Turkey. If Rakka falls, the both will lose serious profits. Anyway, the US has no other choice but to replace its “moderate rebels” with the YPG and pay the price for it – even if the price includes a cooling down of Washington-Ankara relations. Thus, the US-led web of political alliances and relationships in the Middle East is disintegrating roughly. The vestiges of control on terrorists groups sponsored by the pro-Western block could be lost. It leads to escalation of the free for all war in the region. The growing Russia-led anti-ISIS coalition is the only chance of the regional stabilization. The coalition also includes Iran, Syria and Iraq. China and Egypt are candidates for membership. Egypt has a serious internal problem with the local branch of ISIS in the Sinai Peninsula. China will probably participate actively in the Syrian anti-ISIS campaign, but its armed forces extrimely need a combat expirience. So, limited military ground and air force contingent could take part in the anti-ISIS campaign.